Welcome to Day 30 of the series Speak Praise as part of the Write 31 Days challenge. When I began blogging just a few shorts years ago, it was an outlet for me. I hear this a lot from other bloggers as well, and writers who have become published authors. I blogged about my new baby, mommy life, and lack of sleep. But there is one entry I wrote about five years ago when my daughter was only a few months old, and it always stuck with me, stood in my mind like a stone of remembrance when I felt God’s nudge to reach out. Motherhood was a difficult adjustment for me after being in the workforce for several years and then shifting to being home all day with a brand new baby. I wondered if I might be available to reach others in some way just to take my attention off of my loneliness and maybe receive the blessing of friendship in return. At the time, our neighbor, the woman next door, was a teacher like me. She had been put on disability and was home much of the time. I felt prompted to visit her at home and befriend her. That time became a blessing to both of us having fellowship with one another. From that one small step of obedience in loving my neighbor, God opened up other doors to community. I soon joined a mommy group made up of a few faithful women from our church who just loved one another and encouraged each other in motherhood. This community of moms made a profound impact on my walk with the Lord. When the Write 31 Days challenge came onto my radar, little did I know how the support of community would be vital on this adventure of daily writing. And I cannot miss the opportunity to thank my dear friends from the mommy group who began reading faithfully months ago, friends from my past following me on Facebook, and my family who said I was crazy not to. Today’s post is my attempt at expressing my gratitude and sincere thanks to my supportive friends and family as well as the many writers who have been an inspiration throughout the process. Below are links to just a few of the writers who have encouraged me through their comments, shares, and resources. My goal is to build in more of these resources within my website so that YOU, the reader, will have some awesome places to go to nurture your faith, find inspiration for parenting, or fuel your passion for the arts/business. I just have to give a special shout out to Sarah for daily showing up to her blog AND her periscope to deliver her wealth of knowledge on integrating faith and passion into business. I love her vision for sharing Jesus in marketing and media. Check out this transparent and motivational blog post about shining your light! This woman is such a prayer warrior and encourager that honestly I was surprised to see just how simple and fun her homeschool blog is! She is a good example of a woman who knows her calling as a wife, a fabulous mom, and entrepreneur who is using her talents for Christ. She is an encourager, an inspiration, and so creative with her lessons! Homeschool moms, check out her site. She is a veteran 31 Days writer and blogger gifted with encouragement. Her website provides loads of tools for moms in the trenches to connect with God and draw closer to him in faith. I loved her post about Prayers and Praise in the Psalms as it relates to my blog series. She is transparent in her writing and offers hope to moms seeking a deeper walk with the Lord. This is one talented artist who so beautifully and eloquently marries her faith and her passion through her work. 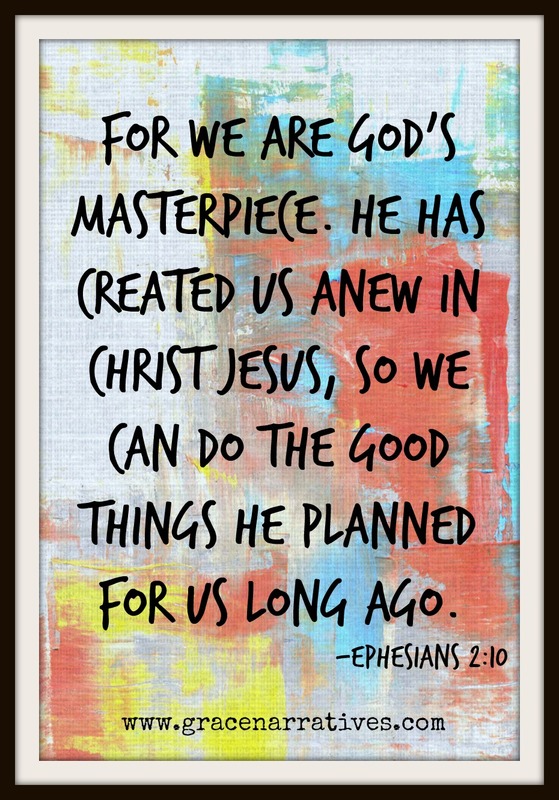 When I read her writing and browse through her graphic designs and craftsmanship I think of one my favorite verses about God’s calling on our lives, Ephesians 2:10. You’ve got to check out Jacquelyn’s websites. With my history of anxiety and panic attacks, finding peace and healing from fear is an important part of my own story. To see free resources like this one that incorporates a wholistic approach to a healthy mind, body, and soul greatly encourages me! I highly recommend Sarah’s Healthy Living Plan and her encouraging series called The Hope Toolbox. Our lives are God’s beautifully designed orchestration of his love and magnificent plan for humanity. Each of us fits into his story, or poema, to fulfill his plan for eternity. 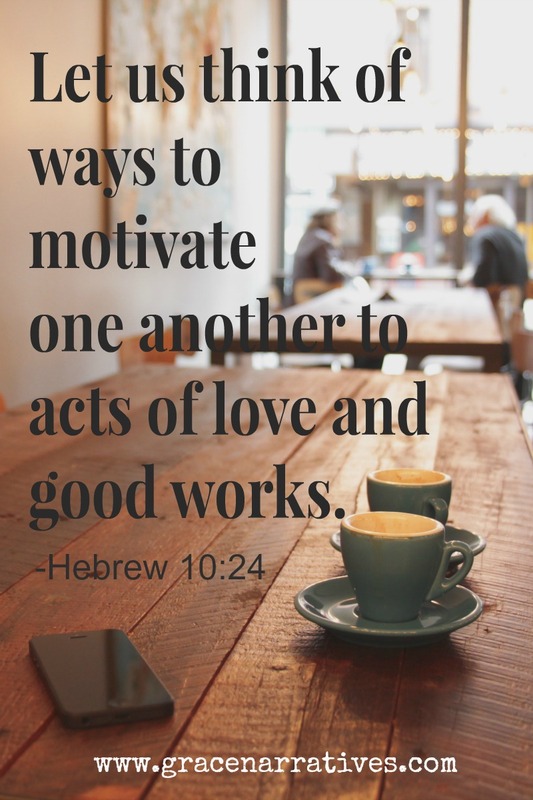 When we build each other up in our most holy faith we impact this world for heavenly purposes. Let’s keep encouraging one another—let’s bring the Kingdom of God into our domains—and all the more as we see the day approaching so that God’s word and his light pierces through the dark. If you are reading my blog for the first time and would like to see other posts in the series Speak Praise, click here. If anything you’ve read here has been a blessing to you, please comment and share with others on Twitter, Facebook, and Google+. Thank you for reading!